Google XML Sitemaps is a very popular wordpress plugin that you can use in your wordpress driven website to generate XML sitemaps of all your posts and pages. This plugin will generate a special XML sitemap which will help search engines like Google, Bing, Yahoo and Ask.com to better index your blog. With such a sitemap, it’s much easier for the crawlers to see the complete structure of your site and retrieve it more efficiently. The plugin supports all kinds of WordPress generated pages as well as custom URLs. Additionally it notifies all major search engines every time you create a post about the new content. Download the plugin first. To get the download link please check the bottom section of this page. Use your favorite FTP program to create two files in your WordPress directory (that’s where the wp-config.php is) named sitemap.xml and sitemap.xml.gz and make them writable via CHMOD 666. More information about CHMOD and how to make files writable is available at the WordPress Codex and on stadtaus.com. Making your whole blog directory writable is NOT recommended anymore due to security reasons. Open the plugin configuration page, which is located under Options -> XML-Sitemap and build the sitemap the first time. If you get a permission error, check the file permissions of the newly created files. Question: There are no comments yet (or I’ve disabled them) and all my postings have a priority of zero! Answer: Please disable automatic priority calculation and define a static priority for posts. Question: Do I always have to click on “Rebuild Sitemap” if I modified a post? Question: So much configuration options… Do I need to change them? Answer: No, only if you want to. Default values should be ok! Question: Does this plugin work with all WordPress versions? Answer: If you get permission errors, make sure that the script has the right to overwrite the sitemap.xml and sitemap.xml.gz files. Try to create the sitemap.xml resp. sitemap.xml.gz at manually and upload them with a ftp program and set the rights with CHMOD to 666 (or 777 if 666 still doesn’t work). Then restart sitemap generation on the administration page. A good tutorial for changing file permissions can be found on the WordPress Codex and at stadtaus.com. 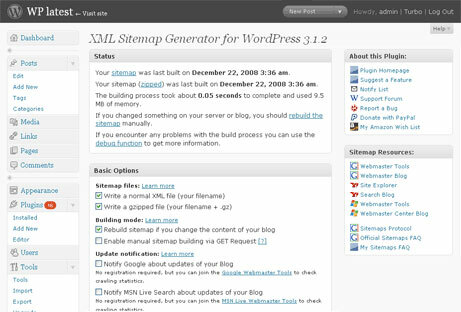 Answer: Please post your question at the WordPress support forum and tag your post with “google-sitemap-generator”. Question: What’s new in the latest version? The plugin comes with various translations, please refer to the WordPress Codex for more information about activating the translation. If you want to help to translate the plugin to your language, please have a look at the sitemap.pot file which contains all definitions and may be used with a gettext editor likePoedit (Windows). I also recommend this plugin. I overlooked changing the files to writable the 1st time around, but after that, it’s been smooth sailing. Good info and review, thanks! Google XML sitemaps by Arne Brachhold is for me the best sitemap generator for WP hands down. I have used a few sitemap alternatives for wordpress but none are as easy to use, stylish and well supported as this plugin. A must for every WP website out there.